Oh Hey There! : What I've Been Reading Lately. 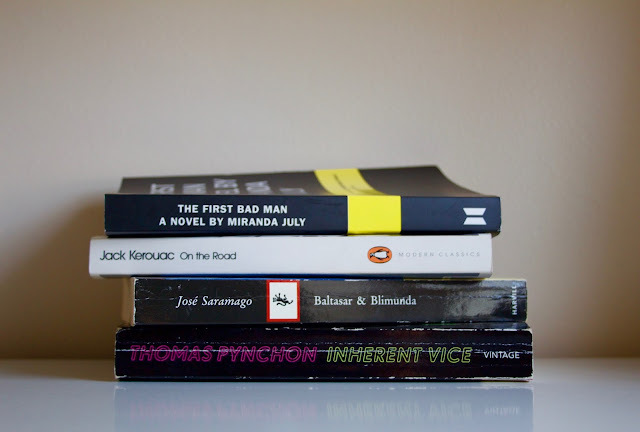 What I am Reading: The First Bad Man by Miranda July, On the Road by Jack Kerouac, Balthasar & Blimunda by Jose Saramago, Inherent Vice by Thomas Pynchon. On the Road by Jack Kerouac is one of those books that I everyone told me I just had to read it too. I am not one to read something just because everyone raves about it, in fact it actively puts me off. Stubbornness be damned, one day when I saw it looking lonely on the bookshelf one day I decided to give it a whirl and have not regretted it. If you are not too familiar with the book it is basically one, long homage to America in the 50's narrating the route of the crazy, road trip dream. It's endless, descriptive passages of the american landscape somehow never get old and Kerouac has an uncanny ability to route you right in the narrative. If you are looking for something to give you itchy feet, this is it. Baltasar and Blimunda by Jose Saramago. I have actually only read a very small amount of Balthasar and Blimunda but it is my next in line after finishing On the Road. I am a huge fan of Jose Saramago and think he is an amazing writer, incomparable to anyone elses work I have ever written. Leaning much to the Avent Garde, Surrealist literature side of things, his work is very detailed and perceptive but they're are still so many layers. I would really recommend reading at least one of his books in you lifetime. Inherent Vice by Thomas Pynchon. I absolutely loved this book and I don't quite know why. It was confusing, the plot was slow and I sometimes had no idea what I was reading. It was fantastic. Set in drug fuelled 1970's L.A it follows the central character Larry "Doc" Sportello through his P.I work and hunt for answers. Which turns out is pretty hard (and even harder to narrate) when you are really high. Although about 90% confusion, it just has these little moments of clarity amongst all the haze and Pynchon manages to sum up people and feelings in such astute, insightful ways. They are like a pin light that guides you through the entire novel.